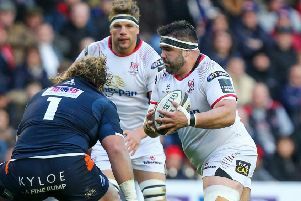 Illness and injury concerns to Roger Wilson and Ruan Pienaar have left Ulster “on the brink” in terms of selection, head coach Neil Doak revealed on Tuesday. South African scrumhalf Pienaar remains a doubt to be fit for Saturday afternoon’s Guinness PRO12 Irish derby in Dublin against Leinster with a knee issue. And backrow forward, Wilson, who played his 300th professional game last weekend in the 13-10 PRO12 win over Connacht in Belfast, is a major concern having suffered a stringer injury to his right shoulder. Doak was also hopeful Luke Marshall would be fit having been sick last week, but the coach also said three other players had been taken ill this week. Doak said Wilson had not been able to train on Monday or Tuesday, but was hopeful some progress would be made on Wednesday morning. As far as Pienaar was concerned, Doak was guarded as to how close one of his key players was to fitness. The Springbok suffered knee ligament damage playing in the Rugby Championship in September and has missed almost half of the club season. He was forced off in the second half of Ulster’s loss to Ospreys in Swansea a fortnight ago. Doak said: “We thought he might have been back in the mix last week, but we will just have to wait and see how he goes. “He has trained and rehabbed, we just have to see how he goes with the scrumhalf stuff. “He is a key player for us and we want him to be 100 per cent when he is on the pitch and not hobbling about,” added Doak, hinting that they would not be taking risks with their star man. Wilson’s omission would be a massive blow given that Chris Henry is ruled out long term and there is no sign of Nick Williams returning having suffered a hamstring injury against Scarlets at the start of the month. Going into the European Champions Cup return game against the Welsh side, Ulster only had 27 players available from their 38 registered Euro squad from which to select 23 players from. “At one stage it looked as though we would be selecting three scrumhalves on the bench for that game,” said Doak. Rory Best and Tommy Bowe are both available this weekend having missed last week’s game under the IRFU player welfare programme. Apart from the fact Ulster are happy to welcome back their two British Lions, Doak admitted it did not help the injury situation. Hookers Rob Herring and John Andrew, who featured last week, could give Doak a backrow option if Wilson was ruled out. Both have played in the backrow, Andrew coming off the bench there last week.